Artist's illustration of the Phoenix lander on the surface of Mars, north polar region. 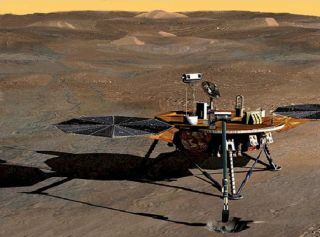 BOULDER, Colorado--NASA's next Mars lander, the Phoenix mission, will head for the northern arctic region of the red planet in 2007, not only ready to dig for subsurface water ice but also probe for habitats of present day life. True to its namesake, Phoenix has risen from the ashes of two unsuccessful attempts to reach Mars: The ill-fated Mars Polar Lander that was lost at the planet in 1999 and a Mars Surveyor Program lander that was cancelled and mothballed in 2000. Work on preparing Phoenix for its Earth departure has reached the half-way point. Many of the scientific instruments for Phoenix were already built, needing little or no modification for Mars duties. Still, the craft is undergoing extensive testing and technological tweaking. Phoenix is the first in NASA's Scout Program. This class of mission is deemed as innovative, relatively low-cost, and complements "major missions" slated as part of the space agency's Mars exploration program. Unlike the up-and-running Spirit and Opportunity Mars rovers, the Phoenix is a one-stop shopping, fixed lander. Once firmly sitting on the planet, the craft literally swings into action, using a robotic arm to furrow into the local landscape, as well as analyze bits of scooped up material with a bevy of instruments. The Phoenix Mission is operated for NASA by the Lunar and Planetary Laboratory at the University of Arizona in Tucson, in partnership with the Jet Propulsion Laboratory, Lockheed Martin, and the Canadian Space Agency. Peter Smith of the University of Arizona's Lunar and Planetary Laboratory heads the Phoenix lander effort. He outlined the goals of the $386 million mission during the 8th International Mars Society Convention, held here August 11-14 at the University of Colorado at Boulder. "Mars is our sister planet. It's small, cold and no liquid on the surface ... however, we do see water in its frozen form," Smith reported. "The Phoenix mission was designed specifically to look at current processes on Mars...not billions of years ago, but what's happening today." Having Phoenix targeted to a still-to-be-picked specific northern polar spot on the red planet, Smith said, "really provides an opportunity for finding a habitable zone on Mars today...not an ancient one, but a modern one." He stressed that Phoenix will do more than look for life, and is well-equipped to study the polar processes on Mars. On arrival at its exploration site in May 2008, Phoenix is designed to investigate the ice/soil boundary. "Basically, the clock is ticking once we land," Smith reported. Touching down inside the arctic circle, just before summer on Mars and at the end of spring, ice will have retreated from the area. "We're going to land on dry soil. We can start digging immediately," Smith said. Phoenix has two prime directives. First is to probe the history of liquid water that may have existed in that area as recently as 100,000 years ago. Scientists will analyze the chemistry and mineralogy of the soil and ice using lander instruments. Furthermore, Phoenix will assess the habitability of the martian polar environment by tasking sophisticated chemical experiments to assess the soil's composition of life-giving elements such as carbon, nitrogen, phosphorus, and hydrogen. Phoenix will dig deep enough into the soil to analyze the soil environment, presumably protected from ultraviolet rays, and look for organic signatures and assess the potential habitability of the subsurface. But setting the spacecraft down safely onto Mars is a bit of dejà vu all over again. When Phoenix plows through Mars' atmosphere in May 2008 and speeds toward the planet's surface, its touchdown won't rely on airbags and bouncing to full-stop - as has been the case for the last three NASA Mars landings. Once free of a parachute, Phoenix will depend upon an "ease on down" propulsion system that was last utilized on the failed Mars Polar Lander mission. Lockheed Martin Space Systems near Denver, Colorado--the builder of both Phoenix and the lost Mars Polar Lander--has been busy performing shakeout tests of the rebuilt descent propulsion hardware. For example, in a test stand, water jets have been attached where Phoenix thrusters are placed and then fired to mimic the kind of machine-gun like pulsing and vibration the lander will undergo en route to a hoped for soft touchdown. Showing a film clip of a "water hammer" trial run, "some call it the Bellagio test," Smith noted. "If you turn it upside down, you'd have the fountains," likening it to the Bellagio luxury resort in Las Vegas and its majestic spouting water show. In the descent to Mars, however, Phoenix thrusters will gulp and heave out hydrazine. The engine effluents striking the landing spot in which Phoenix will conduct science "is a matter of some concern to those members of the science team," Smith explained. While the most ultra-pure hydrazine is to be used, some un-combusted fuel will reach the surface. "So we are very much worried about this issue," Smith said. "We are trying to find ways that we can work with the soil and try to avoid the contamination from the hydrazine and the exhaust gases." Shortly after landing, Phoenix will unleash its two solar panels. They unfurl like Chinese fans. The tip to tip spread of the solar arrays covers nearly twelve feet (4 meters), with the lander sitting roughly four feet (1.2 meters) above the terrain. The "deck" of the legged lander is 4 feet (1.2 meters) across--about the size of a breakfast table--and is loaded with science equipment. Other critical instruments are also deployed right after the lander touches down. A camera system begins snapping images of the surrounding terrain and the area in which the robotic arm will be digging. Also, gear onboard starts to sample the weather at the landing site. Presently, only a UHF antenna is on the lander, meaning all communications with the spacecraft are handled through Mars orbiters. An X band antenna was dropped, shaving off 33 pounds (15 kilograms) of weight and $10 million in cost to the project. A critical item on Phoenix is a nearly 8 foot (2.35-meter) long robot arm. "It's quite a strong arm," Smith noted, "but not strong enough to dig through solid ice." Like a back hoe, this appendage can use its sharp prongs and serrated blades to tear and scrape the soil. In the first few weeks of the Phoenix mission, the arm is destined to dig very rapidly, "just to see if we can find quickly the depth to ice," Smith pointed out. Samples successfully scooped up by the arm are placed into a Thermal and Evolved Gas Analyzer (TEGA) - a combination high-temperature furnace and mass spectrometer instrument that scientists will use to analyze martian ice and soil samples. Specimens are also delivered to water chambers and a microscope station. However, before the agile robot arm is put to work, it must first unsheathe itself from a sterilized "body bag" in which it is housed during the ride to Mars. That's necessary as the arm itself will also be sterilized, precluding it from introducing tag-along microbes from Earth to the surface of Mars, Smith said. "The first thing we want to do is make sure that Mars Odyssey got it right," Smith said, "that there actually is ice under the soil." Smith said that life is believed to form very quickly after the formation of a planet, once water is stable on the surface. Given the clear evidence for a wetter Mars in the past, he added, "why couldn't life exist on Mars and even have found a niche to continue?" "I think the discovery of habitable environments--even the possibility of current life on Mars--by robotic missions would not only focus the human program but would give us a destination and a real purpose," Smith observed. Through one of the microscopes carried by Phoenix, that device is powerful enough to detect a lineup or colony of bacteria, he said. Using the TEGA, any tiny martian critters at the site will be receiving a warm reception. "I hate to say it, but we're not very nice to any microbes that might be on the surface," Smith related. If they are contained in the robot arm-delivered ice and soil specimens, they would be vaporized in TEGA ovens. The vapors from the high-heating go into a mass spectrometer to tell scientists about sample composition, he said. Using Phoenix as a life detection package has never been a goal, Smith said. "We're looking for a habitable zone. We're not necessarily trying to study what out of the thousands and thousands of possibilities might actually inhabit that zone. That's a whole different question...and requires a whole new set of instruments." The Phoenix lander is to dig away at Mars for about three months. As Sun-provided solar energy diminishes at the site, less battery power is available to run the craft's robotic arm. "Then we go into weather station mode...for maybe another two months," Smith said. As the ice starts advancing off Mars' northern polar cap and moves southward, Phoenix will become entombed in several feet of solid carbon dioxide. The lander is not designed to survive being buried in solid ice for six to seven months, Smith said. The Phoenix mission will exhibit extraordinary abilities to help pin down conditions now present on Mars, said Jim Garvin, NASA Chief Scientist in Washington, D.C.
Garvin was the original Mars Scout Program Scientist and Evaluation Chairperson for NASA. "The elegance of Phoenix is its unprecedented ability to 'follow the modern water cycle' at the surface of Mars by investigating the geochemical signatures of water ice and the polar water transport story in the atmosphere," Garvin explained to SPACE.com via email. Additionally, the lander begins the search for evidence of organic molecules by searching for some of them within the martian ice record. "To me, Phoenix recaptures the science lost with the demise of the Mars Polar Lander, while adding new dimensions relevant to future human exploration and the understanding of climate [on Mars], Garvin said.